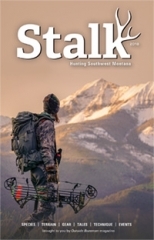 Introducing MONTANA HUNTING ACCESS 2018! Simple to use, all inclusive, no connection needed — your all-in-one guide to hunting in Montana! Includes every document for every Montana Fish, Wildlife & Parks Block Management Area (BMA) in the state of Montana! No connections require (cellular or WiFi) to use MONTANA HUNTING ACCESS 2018! Boundaries provided for every Montana BMA, as well as all public and private lands, are included. 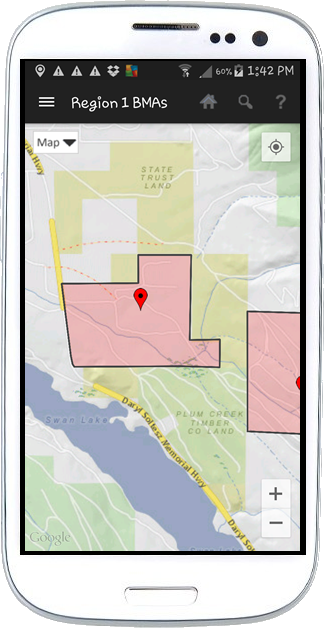 The app works with your mobile device's GPS and a beautiful mapping interface so you can pinpoint yourself relative to land ownership boundaries. Highly intuitive — We want you to spend your time hunting, not learning how to use our app. Click for downloadable press release! Available on iOS & Android--just click! Welcome — let's go hunting! Montana Hunting Access provides everything you need to hunt in Montana. Swipe left side at any time to select which of MFWP's seven regions you want to search. We show you every BMA in your region of choice with Types 1 and 2 color coded. Zoom in to find your desired BMA (or public land area). Touch to access the BMA pdf or directions. Access BMA docs in the field! Touch again to access the BMA pdf (yes the same one you find at MFWP offices!) or directions to the BMA. 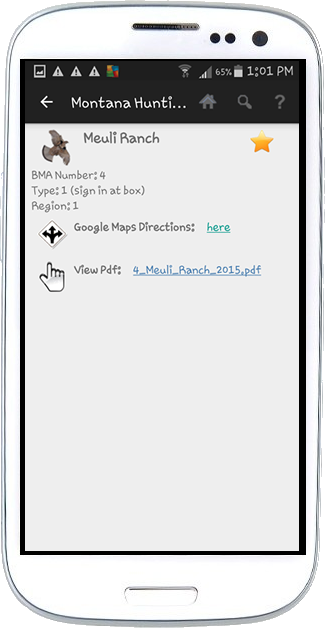 Review the BMA document for landowner contact info &/or sign in box location--right there on your phone!--so you can get permission. 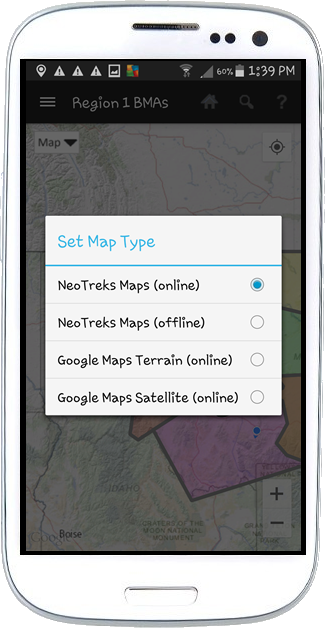 You can select your base map style or let the app do so automatically (and we do so when you are in the field & offline). Go hunting! 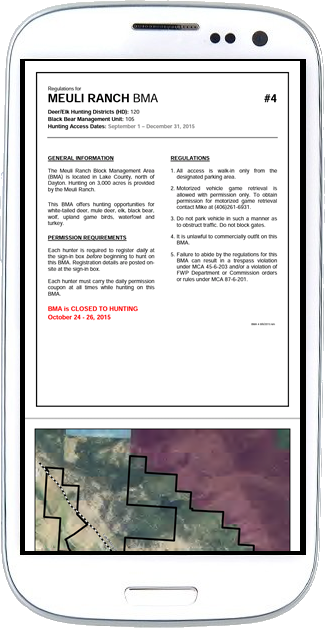 In the field use the app & your phone's GPS to assure you're still in the BMA or on public land. We designed our app to work offline.—We know that you’ll be out in the field when you’re hunting (well duh!). In Montana that most often means you won’t have cellular service, much less WiFi. So MONTANA HUNTING ACCESS works regardless if the nearest cell tower is two counties away. Everything you need comes with the app. Just download it and go hunting; we’ve taken care of the rest. We don’t want to nickel & dime you or complicate your life.—Don’t you hate it when apps ask you to buy something else? Didn’t we just buy the app for goodness sakes?! And we surely don’t want to complicate matters by making you decide which of dozens of possible maps you need to buy. That is a nice option for a cartographer, but for most of us it’s just plain confusing. All those options leave us wondering which map do I buy? ; What’s the difference between them? ; Am I going to waste money when I realize I purchased a map I didn’t really want? When you buy MONTANA HUNTING ACCESS, we include what you need for this year’s hunting in Montana—no separate purchases required or requested. And so much more!—We include the ability for you to (a) search for BMAs based on names, (b) save your favorite BMAs and share that list with hunting pals (and if so we're guessing they're really good hunting pals! ), (c) the full set of MFWP hunting regulations, and (d) don't forget that with a full set of cadastral information on public/private land boundaries, MONTANA HUNTING ACCESS is perfect for hunting not just BMAs, but all Montana public lands as well! Montana Hunting Access 2016: This is an excellent resources for access information on Montana’s Block Management Areas, or BMAs. It contains information on every BMA across the state, with the map and BMA rules right at your fingertips. By using your phone’s GPS, you can locate nearby hunting land, whether it be public or private it allows you to see where you are in relation to the property boundaries. There is also a link to the Montana Hunting Regulations. It even works offline, so no need to worry about wifi or cell service. The cost is $9.99 for both IOS and Android and in my opinion is well worth the cost to have the info at your fingertips. It’s happened to me a couple times: I do all the planning for a morning hunt on the dining room table and, when I head out, I leave my BMA maps behind. Now I’m stuck searching for a block management area to hunt and I'm unable to locate the sign-in box. Luckily, this scenario has happened to other hunters who are a lot smarter than me, so they developed an app called the Montana Hunting Access 2016. 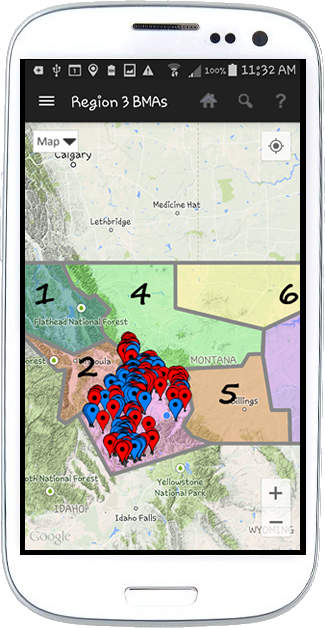 This great app features all the BMAs in Montana by region and type. With your cellphone you can find the area you are searching for, download the rules/regulations page, the area map, and get directions to the sign-in boxes. All the information is located on your phone, so even if you are out of cellphone coverage the info is still right at your fingertips. Plus the boundaries are provided so you’ll know exactly where you are using your phone's GPS. The best part: it’s only $10 for the year. Visit emountainworks.com for more information. Frustrated by his inability to find a Block Management Area sign-in box, Bozeman hunter Scott Bischke fumed that there had to be a better way. Luckily at his Bozeman office he sits next to a talented computer programmer, Katie Gibson, who also happens to be his wife. After accompanying him on a hunt for a BMA she quickly realized why he had been so aggravated. “It was like a lightbulb went on,” Bischke said. “Oh, I totally get what’s going on here now,” Gibson told him." 5 star (*****) "Very impressive. Haven't used it in the field yet, but have played with it at home (exploring). Easy to use, contains all the info you need, and the GPS function will be great when on the BMAs. A good investment. I have another hunting GPS app, but I have to download my maps before I head out. This one is ready to go, any time." 4 star (****) "I just purchased your app and am very excited to use it. The fact that no cell or wifi service is necessary is incredible. Finally a hunting app that can be used where we need to use it. 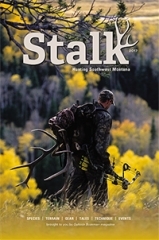 This is a great tool for anyone who uses technology to help expand their hunting enjoyment. I am looking forward to additional information added to the app. Well worth the money." 5 star (*****) "Wonderful! Prefect app. Well worth the $5 [2015 price]. Makes it easy to know where you are in relation to legal land." Check out our recent ads in Outside Bozeman! Watch for other MountainWorks mobile apps coming soon! We are in various development stages for several more exciting new apps for iOS and Android. STAY TUNED! !